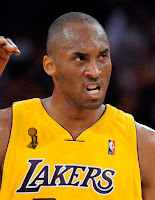 After watching 'Bean Bryant in game 1 of the NBA Finals, I'm convinced he's THE BEST PLAYER OF THIS DECADE, 'nuff said. That is how we are starting out this current installment of Keep It Real Friday. Let us be honest when we talk about Kobe Bryant: Can't stand the guy, but he's the best basketball player since Michael Jordan. Last night was the first time in several years that I realized how hungry Kobe really is, how much this really means to him, and how much the title CHAMPION fits Kobe Bryant. You can say what you want about the L.A. Lakers, and most of it is true. They play soft, their bench is overrated, and they seem to have a let down at times, all true. As far as Kobe goes, none of those things apply. Somewhere around the beginning of the second half of game 1, Kobe Bryant came alive, he realized the Magic were beatable and the red glazed over his eyes, ring four is a more than a possibility. As the Lakers routed the Magic in game 1, Kobe Bryant poured in 40 points proving a point to all who were watching, Kobe's great and your about to see how great. If the 30 ppg. in the postseason average wasn't enough, Kobe is proving how hungry he is, the emotion after every trip down the floor, the tearing off the ref's head, Kobe Bryant is making you get it as well as he does, he's bar none the best the NBA has to offer, for now. KEEP IT REAL! 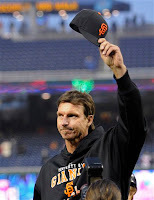 Speaking of unlikeable greatness, the Big Unit just recorded his 300th win. Oh he'll be the last to do it for sometime now, to the point where we can't even figure out whose the most likely candidate to repeat the task. Maybe C.C. but he'll have health issues, Doc Hallday is too old and he's only in his early thirties, so to put it bluntly, the Big Unit is the last of his kind. Randy Johnson has trailblazed through the major leagues over the past 22 seasons. His first wins coming north of the border in Montreal and his latest in the bay of San Francisco, while Randy Johnson has never been the most likable guy his feats are tough to match. Johnson's best stretch of his career came between 1998 through 2002, he was crowned a champion in Arizona and won 100 of his 300 wins during that stretch. Playing shadow to the mystique of Curt Schilling, spending time with the Griffey and A-Rod show in Seattle, and how could we forget his time in the Bronx (34-19), Randy Johnson certaintly has played a full career, that we can attest to. The bottom line is, Johnson is a dieing breed. Between the growth of the bullpens roll in major league baseball and longevity of a players career in decline, it may be tougher than we think for a pitcher to rack up 300 wins, as for Randy, the man won 18 or more games seven times in his career, you find me the guy who will duplicate that. KEEP IT REAL! Let's close this out with someone we like, Belmont Stakes favorite Mine That Bird. The horse that had no shot at Churchill Downs, the horse that got ditched in Pimlico, and the horse that should win over a dying crowd of horse racing fans like myself, let's get behind Mine That Bird. A sport (call it that if you will) that we only witness for a limited time over the continuing sports year has all the expecations and let downs of any professional sport. We have our favorites, every horse expected to be the next best thing come the triple crown season kicking off in Kentucky. You have the teams we fall in love with, teams like the Nuggets and Magic headed to Pimlico. Then you have the teams who are there in the end, the Lakers or my favorite, Mine That Bird. While Mine That Bird won't have any say about Calvin Borel hoping back on him after ditching him in Maryland, if this horse wins the race I hope everyone points their finger at the beast and not the rider because Bird is the one we should be praising. If Kobe and the Lakers win, I won't look toward Phil Jackson, Kobe is the one that got you there and so is Mine That Bird. KEEP IT REAL!